Examine our most popular luxurious custom mattress model in standard and custom sizes. Our handcrafted mattress tends to have a plush surface feeling while the middle of the mattress is firm. Increased body contouring occurs in this custom mattress model. Innerspring unit wrapped in pads with layers of cotton, horse hair, latex, and topped off with wool. Covered in 100% cotton ticking which avoids mattress slippage, lace tufted by hand. No Polyester Quilting. 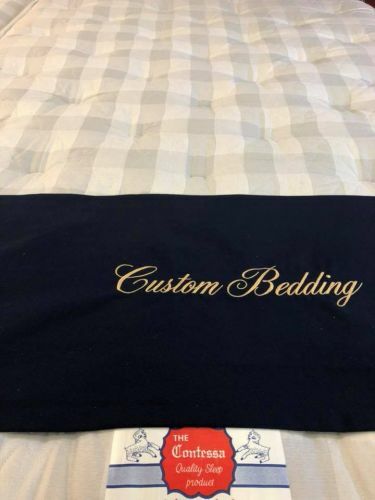 What better way to provide yourself with a natural healthy nights sleep then to have a custom mattress made to fit you. All of our manufactured innerspring mattresses are 2 or double sided for an extended lifetime of your mattress. Please flip occasionally. Our own Eco-Friendly, Green, Healthy Custom Mattresses Manufactured right in NJ and NYC.